After traveling the world in his quest to kill Blofeld, Bond returns triumphant, only to discover a case waiting for him: a large amount of diamonds has been stolen from the South African mines and two offbeat assassins are killing everyone in the smuggling ring one-by-one. Bond goes undercover as Peter Franks, diamond smuggler. What he discovers shocks him: the head of the smuggling ring is none other than Ernst Stavros Blofeld! Now, Bond must resist the wiles of a beautiful smuggler and survive the machinations of Mr. Wint and Mr. Kidd, Blofeld's two best assassins so that he can uncover Blofeld's sinister plot. Never say never indeed. After one picture away - 1969's On Her Majesty's Secret Service - Sean Connery returned to the role of James Bond in 1971 with Diamonds Are Forever. This film also brought back Guy Hamilton, the director of the classic 1964 offering Goldfinger. I'm not sure why Hamilton was away from the franchise for so long, but Connery's reasons for leaving and then coming back are better known. Connery quit after 1967's You Only Live Twice essentially because he was fed up with all of the 007 hype and hubbub. Also, he'd apparently experienced strained relations with the producers. The chances of getting him to ever return seemed non-existent, and it appeared that the franchise would actually go for an American - John Gavin of Psycho - as the new Bond. However, Connery's post-Bond career hadn't exactly set the world on fire, so his prospects weren't as promising as he might have liked. He also wanted to set up a charity, so he negotiated a then-astonishing salary of roughly $1.25 million plus a percentage, all of which went to his cause. I'd love to report that the return of Connery - the definitive Bond - was a rousing success, but unfortunately the results indicate otherwise. Diamonds Are Forever constitutes maybe half of a good Bond movie, but the rest falls into the overly-comedic traps that would harm the franchise in later years. I thought the first half of the film worked pretty well. It's not all cakes and cookies, and much of it seems odd. For instance, we find the return of Bond's arch-nemesis Blofeld, here played by Charles Gray; that made three Blofelds in three films. Unfortunately, Gray was easily the weakest of the Blofelds. He was good in a heroic role in You Only Live Twice, but he comes across as far too chummy and tweedy for nasty old Blofeld. It doesn't help that Bond doesn't seem especially angry with Blofeld most of the time, even though the villain offed 007's wife in the prior film. The two appear positively buddy-buddy at times; maybe Connery and Gray fell back into the routine they established in their 1967 pairing. Despite some weaknesses, I still thought the first hour proceeded fairly well. There are some nice action scenes - including a terrific close quarters fight in an elevator - and the plot is at least mildly intriguing. Then we encounter the moon buggy. Bond uses this silly vehicle to escape from thugs, and that becomes the point at which the movie becomes goofy and excessively broad. For all these years, we've blamed Roger Moore for the lighter tone of his Bond outings, but I'm starting to think the real culprit was director Hamilton. After all, he created the first wacky 007 film with Goldfinger, which was a classic but easily could have been terrible. Hamilton also helmed the next two Bonds in addition to Diamonds. 1973's Live and Let Die and 1974's The Man With the Golden Gun solidified the slapstick and gadget-crazed atmosphere that would dominate Bond for years to come. Once that moon buggy hits the screen, it's all downhill from there. Diamonds stays moderately entertaining but I lost a lot of interest in it. It was still watchable, but I didn't take it seriously anymore. Other problems concern the actors. I really didn't like Jill St. John's portrayal of main "Bond girl" Tiffany Case. St. John looked good in the role but her acting seems forced and phony. Granted, it's a weakly written role with little to do other than stumble about for the most part – despite a promising set-up for the character - so I don't know how much blame St. John deserves. In any case, Case is a poor heroine who harms the film. For the first time ever, I think Connery doesn't benefit the movie either. For one, he looked terribly old as Bond. He seemed to have aged 20 years since 1967 and he appeared pretty paunchy as well. Connery also lacked the usual spark and pizzazz. He really seemed to go through the motions in the role, and while lackluster Connery beats good work from most others, it still comes as a disappointment. Across the board, I think "disappointment" is the word that best describes Diamonds Are Forever. It's not a bad film, really, and it's certainly not the worst Bond would ever offer. However, it easily stands as the worst Connery entry, and it clearly doesn't live up to the expectations his return to the role engendered. Ultimately, I find some pleasure in Diamonds Are Forever, but not a lot. One possibly interesting footnote: does anybody else see anything that looks familiar during the fight between Bond and Bambi and Thumper? A lot of that choreography bears a marked resemblance to some of Pris' movements in Blade Runner. Did Ridley Scott steal from Bond? I can't say for certain, but the similarity is strong. Diamonds Are Forever appears in an aspect ratio of approximately 2.35:1 on this single-sided, double-layered DVD; the image has been enhanced for 16X9 televisions. Diamonds mixes ups and downs to create an erratic but generally satisfactory transfer. Sharpness usually seemed pretty crisp and clear during most of the film, though I detected some mild softness at times. This fuzziness mainly affected a few interior scenes and also some wider shots. Moiré effects and jagged edges caused no problems, and no edge enhancement seemed to appear. Print flaws also caused no distractions. If any defects occurred, I missed them; this presentation looked smooth and clean. Colors appeared bright and accurate for the most part. The Las Vegas shots took best advantage of this. Some others were slightly pale, but I usually felt the tones were lively. Black levels were deep and solid, and shadow detail usually seemed appropriately opaque but not excessively heavy. Some "day for night" shots came across as too dark, but these weren't as problematic as I'd expect. Other than a little softness at times, this was an excellent presentation that just narrowly fell short of “A” level standards. 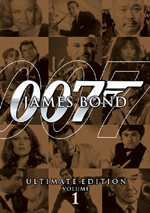 For this “Ultimate Edition” of Diamonds Are Forever, the movie received audio remixes. In addition to the flick’s original monaural elements, we got Dolby Digital 5.1 and DTS 5.1 tracks. These both seemed similar, as I detected no differences between the two. This meant the two mixes offered similarly terrific audio. They broadened matters well and opened up the spectrum. Music showed excellent stereo imaging, and effects also presented good breadth. The spread across the front channels and used the surrounds to bolster the material. Some localized speech also materialized. The track didn’t dazzle, but it provided a nice sense of atmosphere and action. Audio quality was also solid. Music fared best, as the score and songs always seemed bright and lively. Effects and speech showed their age but were more than acceptable. The lines were acceptably intelligible and concise, while effects showed good distinctiveness. Low-end response seemed especially impressive, as louder elements demonstrated nice rumble and punch. Overall, these remixes were strong. How did the picture and audio of this 2006 “Ultimate Edition” compare with the original 2000 release? The UE presented significantly improved visuals, largely because it eliminated the mix of specks and marks that marred its predecessor. Audio also offered a noticeable step up in quality. In addition to the added breadth of the 5.1 soundfields, audio improved. This DVD offered cleaner, more dynamic sound. DVD One includes an audio commentary from various members of the cast and crew. Hosted by David Naylor, this piece edits together interviews with director Guy Hamilton, co-screenwriter Tom Mankiewicz, composer John Barry, actors Jill St. John, Joe Robinson, Marc Lawrence, Lana Wood, Bruce Glover, Shane Rimmer, Trina Parks, Jimmy Dean and Putter Smith, production designer Ken Adam, set decorator Peter Lamont, continuity supervisor Elaine Schreyeck, stuntman George Leech and lyricist Don Black. The commentary provides a solid look at the movie. We hear about a variety of different topics. The discussion covers basic biographies of a few of the participants and we also get a nice combination of nuts and bolts details about the production. Other aspects cover fact about various plot points - both used and discarded - and some fun anecdotes. Some folks don't care for this type of edited commentary, but I enjoy them because they usually are much tighter and more coherent than "screen-specific" examples. The track for Diamonds works very well and provides a lot of interesting and compelling information about the movie and its creators. Over on DVD Two, we get seven elements under the banner of Declassified: MI6 Vault. *Sean Connery 1971: The BBC Interview fills five minutes, 13 seconds. The actor discusses how he’d changed since he started to play Bond, and also looks at why he returned to the series. He also reflects on other aspects of his life and career. This piece is moderately interesting for historical reasons but it doesn’t tell us much. For some stunt info, we get the four-minute and 36-second *Lesson #007: Close Quarter Combat. Narrated by Guy Hamilton, this looks at the movie’s elevator fight sequence. Another archival piece, this one proves more informative. We see fight rehearsals and other behind the scenes elements used to create the scene. It’s good little featurette. More violence shows up in *Oil Rig Attack. The two-minute and 22-second featurette offers narration from series producer Michael Wilson. He tells us about an abandoned sequence as we watch clips shot for it. Though too raw to qualify as deleted scenes, these unused tidbits are quite interesting to see. Called *Satellite Test Reel, a one-minute and 55-second clip shows just that. Along with more info from Wilson, we examine the development of the related effects. This involves storyboards, test footage and final film. Similar material appears in the one-minute and 53-second collection of *Explosion Tests. Wilson talks about the blasts created for the flick as we watch the various elements. Both segments provide a fine examination of effects circa 1971. *Alternate and Expanded Angles allow us different views of five scenes. We can inspect “Elevator Fight” (2:47, 4 options), “Vegas Car Chase” (4:41, 3 options), “Moonbuggy Chase” (3:15, 1 option), “Bambi & Thumper” (3:26, 1 option), and “Bond Arrives on the Oil Rig” (1:54, 1 option). All offer fun material as they let us check out various portions of the shoot. Six *Deleted Scenes finish this area. These include “Sammy Davis Jr.” (1:07), “Killing Shady Tree” (0:50), “Dinner With Plenty” (1:17), “Plenty Returns…” (0:50), “Through the Alley… Again” 0:59), and “Mr. and Mrs. Jones …In the Bridal Suite” (2:33). “Davis” is the most interesting since it includes the performer as himself, but the other five are reasonably entertaining as well. None of them stand out as lost treasure, but they’re good to examine. One of the only interesting elements comes from the presentation of the opening credits without text (2:52). “Locations” (4:24) also gives us a narrated set of clips. Maud Adams chats over the scenes and tells us about the locations. That makes it more useful than the others since they just show snippets from the final film. The rest of the set is a waste of time. Heading to Mission Dossier, we begin with Inside Diamonds Are Forever. Hosted by Patrick Macnee, this 30-minute and 39-second feature follows the usual format of these Bonds pieces. We find mid-Nineties interviews with most of the same participants we heard from in the commentary - plus 1971 snippets from Connery - combined with a variety of film clips, production photos and outtakes. The latter are somewhat unusual for these programs but they add a lot of information, especially in the way they help illustrate an interesting continuity problem. Some of the subjects covered in the commentary are touched upon here as well, but the viewpoints and details are different enough to make the documentary stand on its own. 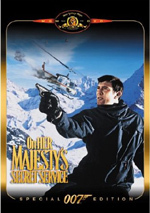 For example, we learn new facts about Connery's involvement and the attitudes taken by the producers to get the series back on track after the relative failure of 1969's On Her Majesty's Secret Service. It's a very solid and compelling program. A second video segment pays tribute to one of the longtime Bond producers. Cubby Broccoli: The Man Behind Bond runs for 41 minutes, 20 seconds, and it provides a decent biography of the series' main supporter. Through the program, we find a nice mix of personal photos, publicity materials, and interviews with those who knew Broccoli. The show focuses mainly on comments from Broccoli's family, including wife Dana, son Michael Wilson, and daughter Barbara. Some others appear as well - including friend Robert Wagner – but the relatives dominate. This adds a nice personal component though I think it may have made the program less frank than it could have been. Still, it's an interesting documentary, and I really enjoyed the parts with Barbara - what a babe! In the Ministry of Propaganda, we find some promotional materials. There are two trailers: a "Christmas" teaser and the theatrical ad. The latter was interesting if just because it featured a line about Plenty's name that was cut from the final film. In addition, the DVD provides five TV spots, none of which is especially fascinating, and three radio ads. These are also nothing special, but I appreciate their inclusion. Within the Image Database we find a set of *photo galleries. This area breaks down into 12 subheadings, each with between 2 and 16 shots for a total of 86 pictures. This makes the collection less substantial than those of most Bonds, but it still offers some nice images. Lastly, Diamonds features a good booklet with photos and facts. Diamonds Are Forever isn't top-notch Bond, but it's a largely interesting effort that merits a viewing. The DVD offers very strong picture and audio plus a complement of solid extras. Diamonds Are Forever will fit in nicely with your other Bond titles. How about those aficionados who already own the original Diamonds DVD – should they snag the “Ultimate Edition”? I’d recommend it. The UE offers improved visuals and audio plus a smattering of useful new extras. It’s a good upgrade. 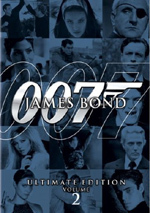 Note that this “Ultimate Edition” of Diamonds Are Forever can be purchased only as part of “The Ultimate James Bond Collection Volume One”. This five-movie set also includes The World Is Not Enough, The Man With the Golden Gun, The Living Daylights, and Goldfinger.